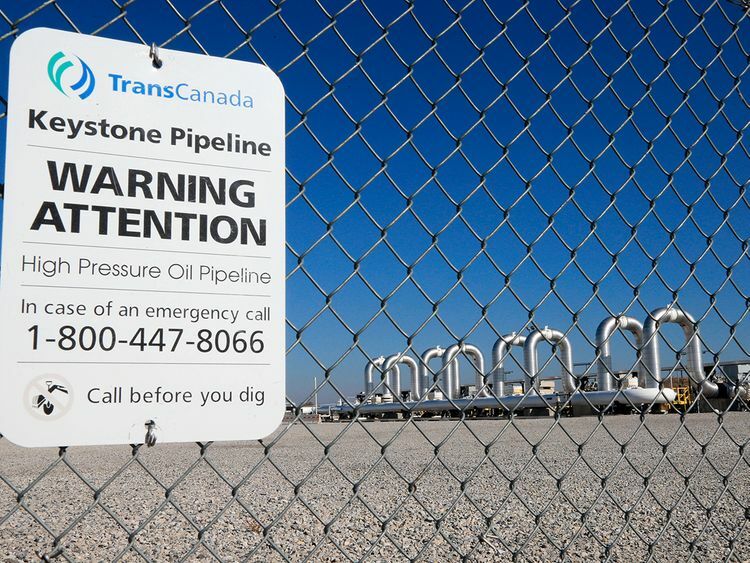 Calgary: President Donald Trump issued a new permit for TransCanada Corp.’s controversial Keystone XL pipeline Friday, circumventing a court ruling that blocked a previous authorisation by his State Department. The move aims to undercut legal challenges to the $8 billion project, including a November ruling by a Montana-based district judge that faulted the State Department’s previous environmental analysis, according to a person familiar with the matter. It could pave the way for beginning some preliminary work, according to Clearview Energy Partners. The pipeline, proposed more than a decade ago, would carry crude from Canada’s oil sands to the US Midwest. Trump’s State Department approved the project in 2017 after President Barack Obama denied TransCanada a permit on grounds its oil would contribute to global warning. It’s good news for Canada’s energy producers after delays to planned expansions of the Trans Mountain pipeline and Enbridge Inc.’s Line 3. The lack of pipelines is partially blamed for a slowdown in oil sands investment and the partial pullback of some international oil companies including Royal Dutch Shell Plc. Unlike the earlier State Department permit, which was issued after a deep environmental analysis required under the National Environmental Policy Act, the new presidential permit is not directly tied to any such review. And the NEPA statute that generally compels environmental study of energy projects and major agency actions does not apply to the president. Pipeline developers are generally required to receive presidential permits for border-crossing facilities. The State Department has been tasked with vetting permit applications for oil pipelines since 1968, when an executive order put the agency in charge. But Trump still retains the authority to issue presidential permits himself, said the person, who asked for anonymity to discuss internal deliberations. And because Trump’s permit is not subject to environmental review requirements in federal law, it effectively restarts the process and undercuts the Montana lawsuit. TransCanada, which is yet to make a final investment decision on the project, applauded the White House’s action. “President Trump has been clear that he wants to create jobs and advance US energy security and the Keystone XL pipeline does both of those things,” Russ Girling, president and chief executive officer, said in a statement. US District Judge Brian Morris’s November ruling found that the 2014 environmental assessment by the Obama administration fell short. Trump had used that review in a March 2017 decision allowing the project to proceed. Morris said the government must consider oil prices, greenhouse-gas emissions and formulate a new spill-response strategy before allowing the pipeline to move forward. Administration lawyers could file a motion seeking to dismiss the Montana case, which it has appealed to the 9th Circuit Court of Appeals. “Rescission of the prior presidential permit appears to render those proceedings moot,” ClearView analysts said in a note. Mooting the Montana case could end delays related to further State Department environmental review of the project and void an injunction blocking pre-construction work, possibly allowing it to begin in August, ClearView said. Although the move may help resolve concerns in Montana that focused on the State Department’s environmental review, it does little to address a case before Nebraska’s Supreme Court, which is yet to rule on an opposition challenge to the state Public Service Commission’s approval of an alternate route to the path championed by TransCanada. TransCanada also appears to need multiple water quality permits for the project in South Dakota, according to Clearview. US refiners have been seeking alternative supplies of heavy crude oil after sanctions against Venezuela and a political crises in the Latin American country brought imports from the country to zero in recent weeks. At the same time, Canadian oil producers have been desperate to get new export pipelines built after a surge of new production last year caused a glut that depressed prices and prompted Alberta to impose production curtailments. “The interest in having Keystone completed has never been higher, from a security standpoint,” Kevin Birn, IHS Markit’s director of North American crude oil markets, said in a phone interview. “The US refiners demand heavy oil in the absence of Venezuelan” crude, he said. Conservationists blasted the decision, saying it did nothing to address deep environmental problems with the project.